Keith “KR” Raggette is an Air Force veteran after serving 27 years. 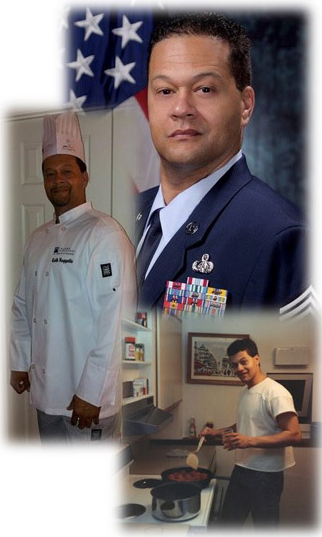 During his Air Force career, he traveled the world over, experiencing and perfecting multiple cuisines along the way. Prior to his military career, he honed his culinary skills while working in several fast food, seafood and steakhouse restaurants, and most recently at St. Phillip’s College Culinary School. grandmothers preparing dishes both for everyday as well as for special occasions and holidays. Growing up in a Creole, Cajun, and Southern-inspired family, KR’s inspiration comes from this style of cooking. He was always an eager pupil when his mother and grandmothers would pass on various “trade secrets” into what made their dishes different from those enjoyed by other “Southern” families. About 30 years ago, KR became interested in Texas-style barbecue. He always had barbecue growing up, and really enjoyed watching his father BBQ ribs and chicken to perfection on an old 55-gallon barrel drum that was converted into a barbecue pit, learning the art of maintaining a constant temperature and basting the meat to maintain its moistness. It was about 20 years ago that KR really began to master the art of “slow smoking” meats. His first smoker was an upright smoker then he eventually “graduated” to a smoker with an offset firebox. From this point on, KR’s “smoking skills” took off!